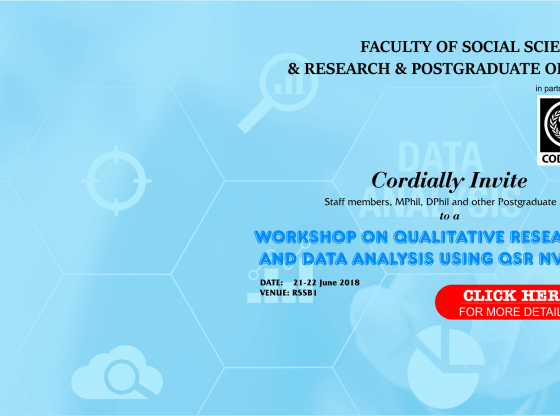 The Faculty of Social Sciences together with the Council for the Development of Social Science Research in Africa (CODESRIA) and the Research and Post-Graduate Office would like to invite faculty and non- faculty members as well as MPhil, DPhil/PhD and other postgraduate students to a 1½ day workshop on qualitative research and data analysis using QSR NVivo. The workshop will be facilitated by Prof Nyikahadzoi (University of Zimbabwe, Centre for Applied Social Sciences) and Dr Maunganidze (Midlands State University, Faculty of Social Sciences). The workshop will be held from the 21st to 22nd of June 2018 at the Main Campus in RSSB1.